Rental Charges: We calculate rental fees from the time the building users (including caterers) gain access to the facility until the time they leave. It’s important to include sufficient set up and clean up time as you plan your event. Accessibility: UUCR is handicapped accessible. There are fully accessible restrooms on the main and lower floors (which can be reached by elevator). Alcoholic Beverages: Only wine and beer may be served, and only with knowledge and permission of our Church Administrator. Maryland state law must be observed, especially no service to minors. If your event will have wine and beer for sale or included in an admission fee, then you must obtain a special one-day Class C license from the Montgomery County Dept of Liquor Control. Information is available by phoning 240-777-1999. Wine and beer provided without charge requires no license. Clergy: We welcome outside clergy to conduct services at UUCR, with prior approval of our minister. Confetti: Glitter, birdseed, rice, confetti, bubbles and flower petals may not be used for decoration or thrown inside. Bubbles and flower petals may be used outside only. Damage or Injury: The renter is responsible for any property damage, loss or personal injury resulting from the rental of the premises. Homeowner or organizational liability insurance may cover such rentals, but renters should check with their insurance agents to verify. Decorations: No nails, screws, thumb tacks, glue, tape or other materials can be used to hang items on walls or windows. Bulletin boards, pictures and other art work and wall decorations will remain in place. Nothing can be removed without prior approval of our Church Administrator. Candles and incense may be used by special arrangement with our Church Administrator. 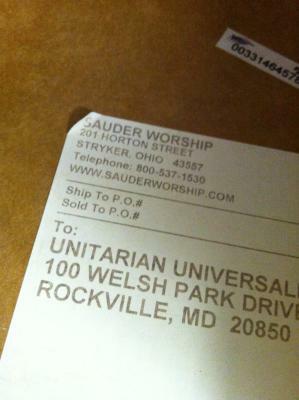 Deliveries: UUCR is not responsible for deliveries from caterers, florists and furniture rental, etc. to the building or for things left before, during or after your event. Environmental Awareness: UUCR is committed to caring for the environment. Please use environmentally friendly products for your event, and reduce trash by recycling. There are recycling bins throughout the buildings. Flowers: You can make arrangements for flowers with the florist of your choice. Please coordinate delivery with your florist or make special arrangements with our Church Administrator. Please take all flowers with you after your event. Kitchen: Use of the kitchen is a separate rental and must be arranged with the UUCR office. Sinks, stoves and counter space are available for your use. Refrigerator space must be arranged for in advance and availability depends on UUCR events. Please do not leave any food or beverages behind after your event. No utensils, pots, linens or paper/plastic goods (other than paper towels and trashcan liners) are available. Lost and Found: UUCR cannot be responsible for items left before, during or after your event in the buildings. Parking: There are approximately 150 parking slots in the UUCR parking areas. Renters and guests can also park on neighborhood streets where there are no restrictions. Please honor parking lot signs including the handicapped, reserved and no parking areas. Don’t park in wooded areas outside of defined spaces; and do not park in the driveways, which are designated fire lanes. Please advise your participants of these limits. Piano: A fee is charged for the use of the piano. Absolutely no food or drink is allowed on the pianos and covers must be put back on when finished. The pianos are tuned regularly. Any questions regarding the tuning or condition of the pianos will be referred to the Director of Music. The pianos cannot be moved to a higher or lower location under any circumstances. Discrimination: There will be no formal or informal discrimination based on race, ethnicity, gender, or sexual orientation at any event held on UUCR property. Smoking: Please announce at your event that the Unitarian Universalist Congregation of Rockville has designated its buildings as NO Smoking buildings. Smoking is permitted only outside the building. Ash receptacles are located outside the main entrances to the building. Contraband: No firearms or other weapons, fireworks, or illegal drugs are permitted on our property. Security Deposit: A refundable security deposit confirms your space reservation. After your event, your security deposit will be refunded, less any damage or overage fees. Sound System: The sound system may be used only by prior arrangement. The attendant will open the sound cabinet and instruct the user. The sound system must be attended at all times to insure proper functioning and for the convenience and protection of the user. Trash: Building users are responsible for taking the trash and recycling generated by their event to the dumpsters. Mixed paper and cardboard must be separated from comingled glass, plastic, and aluminum. There are recycle bins in the kitchen and recycle containers next to the dumpster.